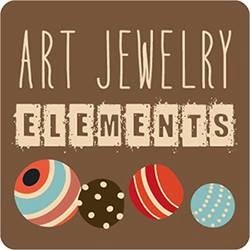 You may have noticed that we changed our name and look over at Art Jewelry Elements - we are now Art Elements. Read all about it! Also it's time for the October Component of the Month - this month, Jennifer Cameron provided us with these cute sugar skulls! I managed to take a photo of mine this time, before I made my necklace! I love the colors she used, and wanted to make a colorful necklace as well! Here's what I made, using seed beads and czech flowers! I think it's fun! I was so happy to be able to use these czech flowers, as I am currently obsessed with them. I went to Prague this summer but was not able to find any czech beads for purchase! 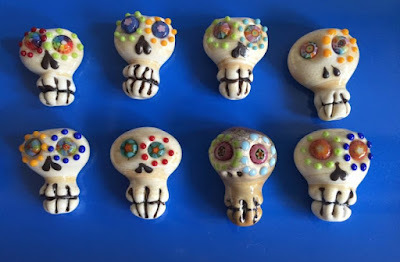 Thanks to Jen for the sugar skull inspiration! Check out what everyone else made! What a great piece Sue, the flower hat is such a wonderful idea and all the colours look amazing! Omg the flower hat is still making me giggle. I love the green eyes on your skull! This looks like a great necklace to wear every day, awesome Sue! beautiful design with lovely complementary colours. What a great idea to use the Czech flowers in colors to accent the skull. I love the way it all works together. Bright and cheerful! Oh that flower hat is adorable! Colorful, wearable... really fun necklace! Oh, I also thought about using czech bead flowers! They fit beautifully with the skull! I have also a kind of obsession with them, especially the tiny ones (8mm). I can send you the info where I order them (directly from the production site, but you always need to buy a lot). I love the Czech flowers and they are perfect with the skull. Happy Halloween! I really like this Sue - very pretty and a lot of fun...perfect for the theme. Eeeeeeeeeeeeee! Sue, this necklace is way too cute! I love it! Very beautiful and elegant necklace. Gorgeous design... I Love the flowers! They are a perfect partner for the focal. What a playful necklace! I love all the colorful flowers and the strong contrast with the black and white seed beads. This is super cute and super fun! I love its hat you made and the czech flowers are perfect for it! Thanks for participating! I like your colorful design. Your beads are so pretty!